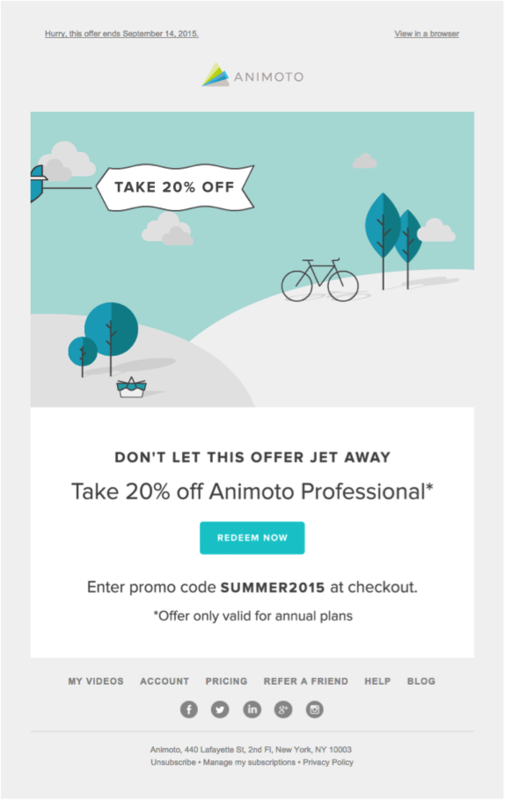 What should you consider when using images in your email marketing campaigns? Today, the majority of designers in email marketing departments emphasize the importance of using visuals and images for aesthetic and brand awareness purposes. Email marketing specialists pay enough attention to email deliverability and the display process, and that’s why many of them want to use images for optimization. Here, we will give you advice on which aspects you need to consider in creating your email marketing campaigns to increase the open rate and click through rate, and generate high levels of ROI. First, let’s think about what’s better for the human brain: visual perception or text? Sometimes marketers must be good psychologists and make their decisions based on the study of the human brain. Let’s look at the human brain in terms of psychology. It’s no secret that the brain processes visual content 60,000 times faster than text. The information presented via images is much better remembered and perceived. Famous developmental molecular biologist John Medina in his book “Brain Rules: 12 Principles for Surviving and Thriving at Work, Home, and School” talks about the benefits of visual memory. “It is more work for our brains to remember text because the brain sees words as many tiny pictures,” he says. In his research, Medina proves that text and oral presentation are less effective compared to those including visual graphics. So we conclude that visual content in email is one of your greatest marketing assets. Intensify your visual information; create detailed product pictures in your emails. 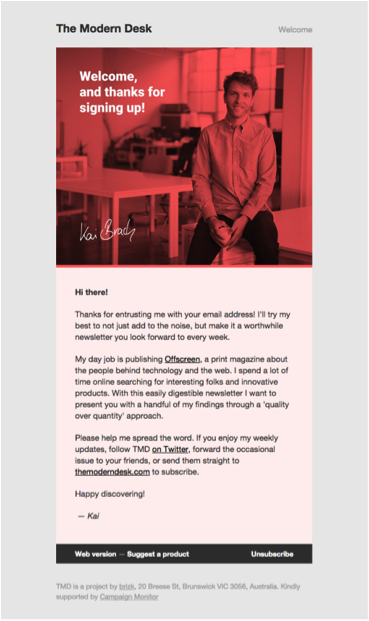 Remember, subscribers click on your links in emails — don’t disappoint them with stock images from your website. The rules of using the email images from email service SendPulse: how many and when? For example, if you want to make a presentation of your product in the email, the included pictures must be detailed and multi-angled. 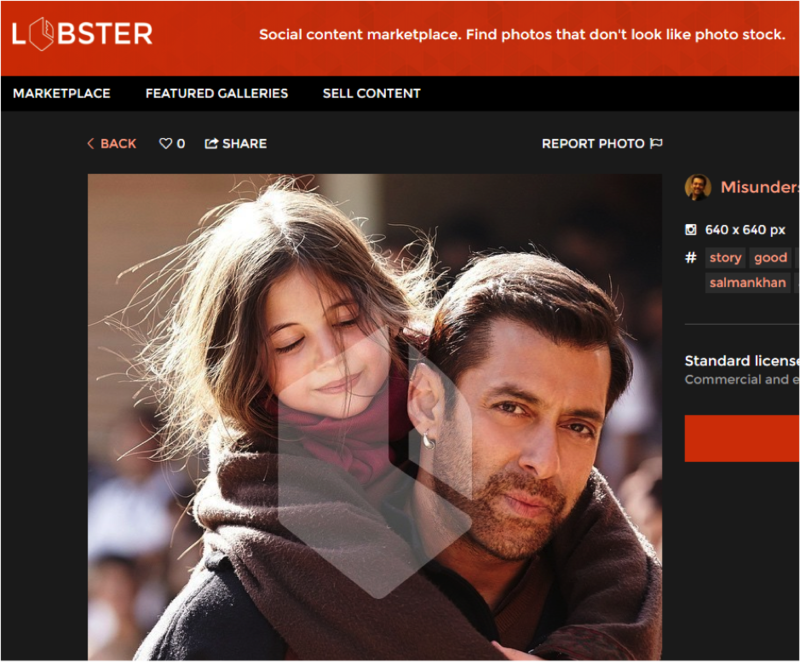 Good images of your product cause immediate desire to touch and buy. Or look at this one: “This is worth the scroll”. It took less than a couple of seconds and you were involved in scrolling through this tempting email. You see, sometimes you need just one intriguing picture instead of ten boring ones. Your email subscribers hate receiving boring emails. It is the most annoying thing ever to delete boring emails. Use interesting and attractive images and then the readers won’t put them in the spam folder. Just try to do your best. 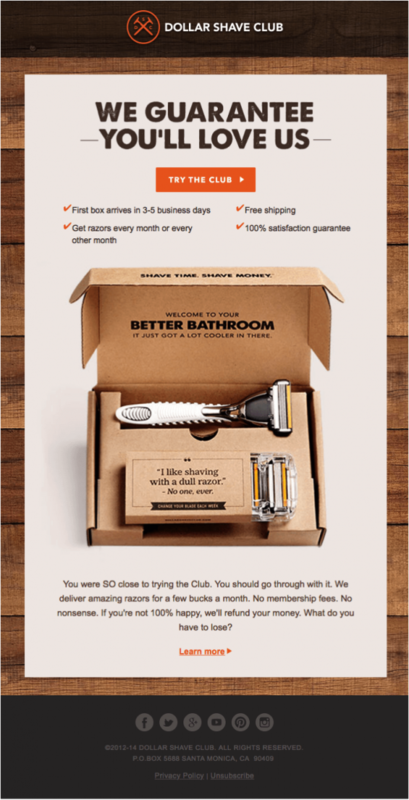 The email from Dollar Shave Club below includes just one image in combination with appropriate words. In fact, the purpose of email are not these three mentioned above. The purpose must be realized within a few seconds of reading the email. That is why it is not necessary to burden your email with various images, icons, and fonts. Every time you determine the images used for your email campaign you should worry about deliverability — that’s why you need to regulate the use of images. Remember, you are designing an electronic mail that has usability limitations. Neil Patel is an entrepreneur and online marketing expert. In his article “The Eight Psychological Insights into the Brain That Will Improve Your Marketing” he emphasizes that all images you use in your marketing must be accompanied by the correct words. And this is exactly what you should do with your emails. 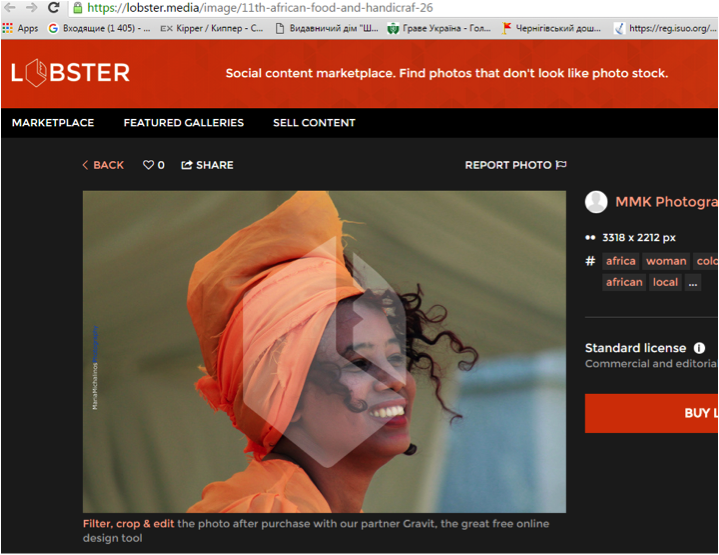 The subscriber is more likely to trust the email when they see beautiful pictures accompanied with appropriate words. These words help your subscriber believe, trust, and have a long relationship with your company. Pay attention to the text in your email because it deals with optimization of trust and improves conversions. Thanks can lead to long-term cooperation. So why not use it in emails? Look at the email below — the right words evoke trust. This is really important after user subscription. First your eyes see the image, and immediately after the brain makes a shape: “The young man is good-looking, smiling, and seems intelligent and educated.” You’ll then quickly run through the text below the picture, phrases like: ‘I’ll try to do my best…’, ‘I’ll spend a lot of time…’, ‘Quality over quantity approach’, ‘My job to publish magazines behind technology and the web.. All of these — the picture and the words — encourage readers to get involved and believe in your email. Make a promise in your email but don’t forget you should confirm your words with deeds. Use a special offer, give a discount, and offer a trial period. Do not focus on signing up, or selling your product. Make interesting and valuable emails. For example, make it educational or instructive. Empathy – this psychological aspect can act as a guide in choosing the right image for your email campaign. What is empathy? It is the capacity to understand or feel what another person is experiencing, the capability to place oneself in another’s position. In this way the pictures that have a great emotional impact energize the reader. Images have the power to inspire the subscriber to read the email to the end and make the right decision in your favor. Keep in mind that graphic design has no space for making mistakes. The wrong image will go straight to spam folder. Also take into account that large images take a long time to load and people will just close the email rather than waiting for it to load. 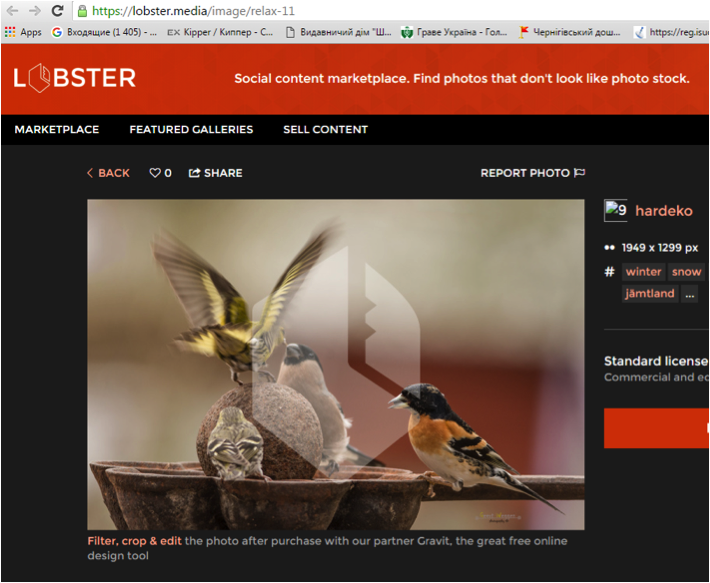 Lobster is a service that provides a wide range of images. For many marketers it helps in finding media they can use as part of email campaigns and for other purposes too. Look at the portrait of the father and daughter. The delicate relationship between them passed through the screen in one second. It is highly recommended to use such images in your campaigns. Looking at animals and nature is always relaxing. So why not use the same technique in your email. At least for a couple of seconds the subscriber will relax. There is no person in the world who does not love to smile and have fun. The girl in the picture is so beautiful and cheerful. We want to ask: ‘What is her secret?’ And we just smile at the monitor. Rely on harmony and balance when using images and text in your email campaigns and you will be successful in maximizing the click-through rate and the level of ROI. We wish you creative experiments and good luck in creating your templates for your email campaign.